The first thing that stands out if you are going to install the product is the pretty big list of not common prerequisites. The last prerequisite is that COM+ (Network DTC access) component should be configured differently than the default settings. If you are using a SQL server for storing your database also the same settings should be configured on the database server. The installation will set these settings (as described in the manual) automatically for the COM+ component. At last optional the services Themes and Windows audio should be changed to Automatic startup type and started for the installation if you would like to use advanced RDP Redirection features. If all prerequisites are done the installation can be started using the Propalms-tse.exe. During the installation you should decide if you want to use Propalms for a domain or for local users only. If you choose domain users (and probably almost everyone chooses that option) you can create, join or restore a team. A team can be seen as a farm in Citrix words. Restore can be used if the server has failed and need to rejoin the team (nice feature). During the create option the database settings are configured (MSDE or a SQL database server), a team name should be specified, a domain user should be specified for the COM+ services (will become local administrator) and a group name should be specified which will become the Propalms TSE administrators. During joining or restoring only the database server should be specified and the team should be acknowledged. After the installation the server should be rebooted. After the first manual installation additional server can installed seamlessly through the Management Console without further manual intervention. All configuration settings are being set via an administration website via de Propalms servers. If you already have experience with the Tarantella Global Desktop the interface will look very familiar, because nothing has changed except the picture is now the Propalms logo. The first step is to configure your team using the Manage tab. The first installed server (via the create process) will host three necessary roles (Web server, load balancer and application server), other joined servers will host done of the roles by default. The roles should be added via the Add roles wizard, which will start addition installation and configuration on that server (probably followed by a reboot of that server). Several user based settings and applications can be assigned to users, groups or organizational units. These objects should be added to the Propalms configuration if you would like to assign applications or settings to such an object. Also on the manage tab you can configure client groups. Client groups are actually filters based on IP private or public range, Client NetBIOS name, Client Operating System and/or client OU. To a client group objects like applications, connection settings and/or printers could be connected. A nice option is that you can see which client(s) are using the setting of the client group and if there is a group conflict. Connection settings like display, reconnection, compression, bandwidth control, client mappings and some special Terminal Server registry settings are configured in Connection Settings. Several Connection Settings configuration can be created and connected for example to Client groups or applications. Application publishing is also part of the manage component. Propalms is using the start menu for choosing the application. Unfortunately in my test environment not all programs were available, for example Acrobat Reader did not show-up in the list and need to typed in manually (because there is no browse function). 1) The application shortcut is specified in the All users\Start Menu\Program folder on the app server. 2) The shortcut should have the target exe of the application explicitly specified in its target properties. During the wizard you can specify the shortcut locations (favorites, start menu and desktop), file associations, the servers hosting the applications, the users/groups (which are already imported in the Propalms software) may use the applications and connections setting (connection type, total maximum concurrent session and maximum sessions per server). The second component for configuration is the options tab. At the options tab the default settings can be altered for users and administrators, but the most used options are Load Balancer, Database Servers and Lockdown Policies. 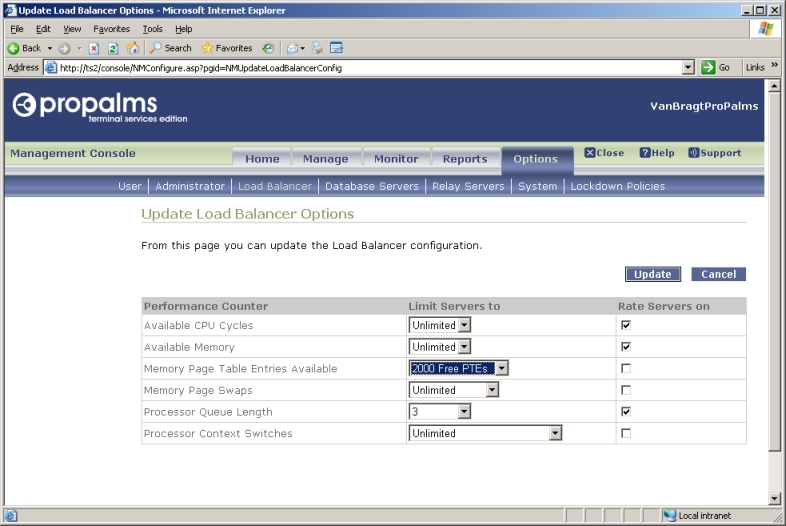 Propalms supports one load balancer based on maximum six performance counters. Like the previous Global Desktop the user load counter is not available. Servers can be limited to a maximum for those counters, causing the server giving a full load. Within Propalms an additional back-up database server can be configured. Via Database Server this back-up server can be added and a sync interval can be chosen. Using this option you do not need to create a clustered solution but Propalms will arrange the synchronization. With Lockdown Policies the most used Group Policy settings can be configured out of the Propalms console. Also the user will connect via a website called Propalms Launchpad. Propalms is very busy extending the supported Thin Clients. At the moment they have a CE, Linux and MAC Client and some packages for several Thin Clients. Using a Windows client the client software needs to be installed. This can be done from the website but require administrator privileges, so it is a good idea to spread the client via another mechanism. If necessary you can also use the native RDP client with limited options to connect to Propalms. If the user is logged on (and the client is available) he can start his applications. Like many RDP based products if the user has two or more applications open from the Terminal Server both will pop-up in the front when one of the applications is chosen as active application. Within the client the user has some nice features. The user can choose which applications will be displayed in his favorite's page, start menu and desktop. Also the user can choose which display settings, connections settings and reconnection configuration he wants to use. But the most useful feature is the connection page. On this page the user can see his active applications, disconnected applications and active applications on other clients. From this page the user can fetch (reconnect) applications from the other client to his current client. Which I found less decent is the way the application is started. In first place you will some screens from the Propalms client, followed by a windowed frame where the logon process is displayed. If that part is finished the Propalms window is only showed and than the application is seamless displayed. It would be nice if that windowed frame could be hidden for the users and that the team name is displayed in stead of the IP address of the Terminal Server on which the application is started. 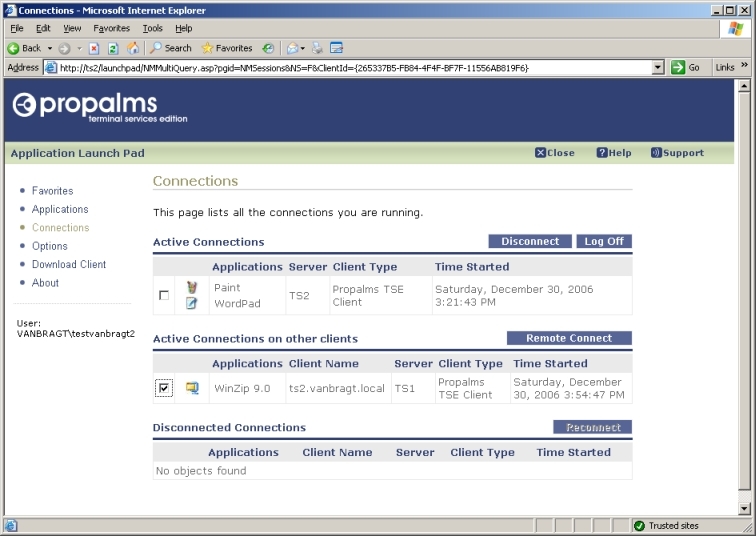 This behavior can be turned off within the Propalms seamless configuration, so no Windows Logon screen is displayed. The downside is that if there is any notification window from Windows logon during the logon process (like password has expired) , then the login will halt as the notification window wont be displayed to the user and the logon wont process unless the user acknowledges it. Like all product Propalms has the Relay component to enable secure access to the environment via the Internet. Most RDP based SBC products rely on basic Windows Terminal Services for monitoring. However Propalms has these options available within their own console on the tab monitoring. 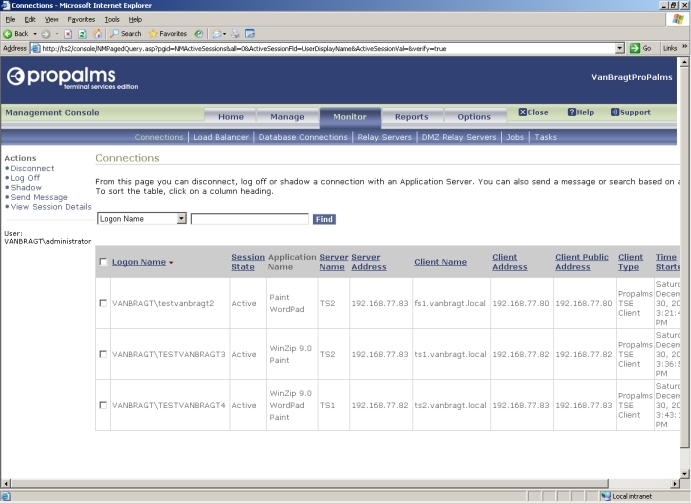 Via Connections option users can monitored and the default actions like session details, shadow, disconnect and logoff can be performed. At the load balancer option you can see the server load displayed via numeric values. Also the connection of the Terminal Servers with the database can be viewed using the Database Connection tabs. If you add an application, change server roles, import groups and other actions Propalms is creating a job for that action. In the log option you can see the status of those jobs with a history record. 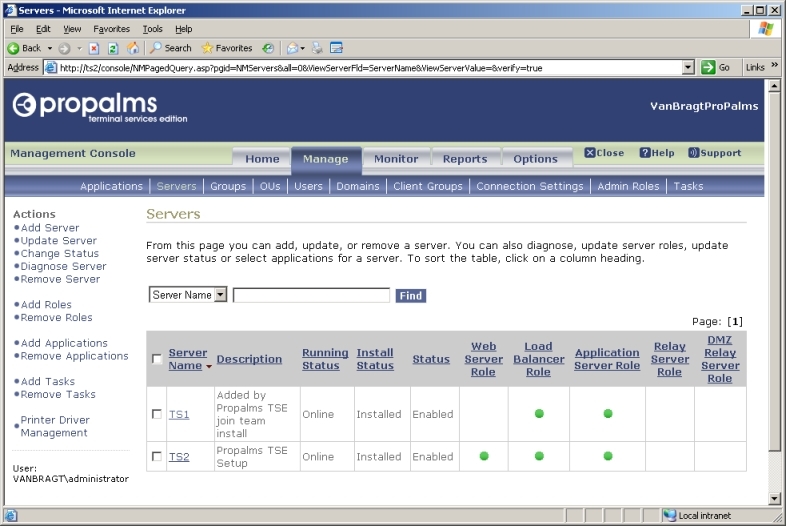 Propalms also support some tasks (reboot server and synchronizing of the database) which can be monitored. Propalms also have nice reporting possibilities. Via the report tab several kinds of reports can be displayed and exported as CSV file (so no graphical reports). Report can be created based on user, printer driver applications, sessions, client and servers. Examples of useful reports are session duration, total time of applications, peak usage of applications and sessions per user. Propalms also had an audit log where all changes are stored both based on access to the environment as configuration changes. If you have experiences with the former Canaveral or Tarantella product you will notice that the basis of the product is still based on those products. The interface is not changed much and also not many new features are introduced. But because the product was already a good product it still can compete with the other products (but the competitors are at least at the same level now). Propalms did a nice job by adding the Uniprint universal printing solution (as a separate add-on) to the product. Also a plus is the own monitoring options and reporting functionally. PS Take a look at the name of the database so you are really sure it is the old Canaveral product. Only minor updates in this version, but see below for Propalms future plans. Propalms will have an Enterprise offering coming out soon which will concentrate on pro-active management, including such features as system/service monitoring and alerting, advance reporting and diagnostics, resource analysis and more.